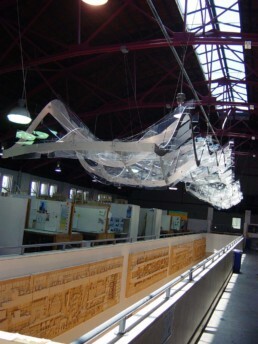 This collaboration between OEC and the Catholic University of America’s School of Architecture and Planning shows the degree of complexity, and efficiency that can be obtained through the use of digital, design, planning, and fabrication techniques. This item was conceived and base designed by a group of students at the school. With our assistance, this was detailed, fabricated and installed 2 weeks in advance of the scheduled opening and within the time of one semester. It is approximately 15’ wide & 250’ long, and stands as a testament to what can be achieved with digital collaboration methods.